This is a relatively technical (and wordy) posting. The first few paragraphs outline just enough genetics to understand the terminology. If you’ve had Biology 101, this is probably review. The rest is algebra. If this kind of approach is not for you, suffice it to say, a dominant model gives a much, much, much better fit to the data than a recessive one. You might want to then skip down and read the last four paragraphs. “Is the predisposition to be a white squirrel in Brevard NC inherited in a dominant or a recessive manner?” is one of the most common questions I am asked (actually, most people just ask is it a dominant or recessive trait but I have chosen my words carefully here because we know next to nothing about its genetic basis and it is bound to be more complicated than that). Unfortunately, squirrels can not be bred in cages like fruit flies. They require a small woodlot of mature trees to complete courtship. Males are attracted to females in estrus from hundreds of yards away. She usually has multible mates and there is no way to tell which male(s) succeeds in fertilizing her eggs. That is not to say that a dedicated researcher using sophisticated molecular techniques couldn’t gather data relevant to the question but I have neither the training nor the finances to take this approach. Instead, I will argue below that the white variant is dominant based on an analysis of population genetics. A central tenet of population genetics is the notion of gene frequency. If there are two possible alternative genes, usually referred to as alleles, governing a given condition, only one can occupy the position for that gene on any given chromosome. But in squirrels, like most animals, each individual acquires two of each chromosome, one from each parent. If the two alleles are the same, we refer to the individual as homozygous. Of course, it could be homozygous for either allele. This is one reason why we usually use letters to represent the alleles. In this case, lets call the gene predisposing the white condition “w” and the gene predosing the gray variant “g” (more traditionally, the upper and lower cases of the same letter are used with the upper case assigned to the dominant feature; but we don’t know which is dominant in this case, and I find the “w” and “g” designation more descriptive). Thus, we have two possible homozygotes: “ww” and “gg”. If the two alleles are different, i.e., “wg” or “gw”, we say the individual is heterozygote. These combinations of genes are referred to as the genotype for that trait. The actual trait produced by the genotype (white or gray pattern in this case) is known as the phenotype. Whether or not such single genes exist or not, the variants do seem to be inherited as single units. A litter may be mixed, that is, some white – some gray, but each individual can be categorized as either white or gray. In other words, coat color pattern does not blend together like when two different color paints are mixed. Geneticists would say that the genetic predisposition for these coat color patterns segregate (separate) during sperm and egg production. The final result depends on what other allele the segregated one is recombined with during fertilization. If we were able to determine the genotype for every squirrel in the breeding population, we could determine the frequency (% divided by 100) of each gene in the population. Usually, one gene frequency is represented by the letter p and the other q. Obviously, p + q = 1.0 unless there is a third allele represented by r in which case p + q + r = 1.0 (percentages add to 100, frequencies add to 1.0). As you will see below, there is an indirect way to estimate these gene frequencies. We do not actually have to catch and examine the genes of the entire population. If you know which trait is dominant, you can assign either p or q as its frequency. Let p = frequency of the dominant allele. Then the proportion of the population bearing that phenotype will be p^2 + 2pq. On the other hand, the only way to produce a recessive phenotype is to get a double dose of the recessive allele which has the probability of q^2. So if you know what frequency of the population is of the recessive type, determining q is a simple matter of taking its square root. Since p + q = 1, then p = 1 – q. The problem is, we don’t know which, “w” or “g”, is dominant. That’s what we are hoping to shed some light on. Figure 1 shows the percent white as determined by the annual Brevard Squirrel Count from 1997 through 2011. The trend line indicates that this variant has been steadily increasing. The most recent value (2011) is 40.3%. This equates to frequency of .403. If the Brevard white variant is recessive, like the albino of Olney IL, then q = .635. Since p = 1 – q, the frequency of the dominant allele “g” would be .365. But what if the white variant was dominant. We would still need to use the proportion of recessive phenotype to determine the frequencies since the formula p^2 + 2pq = .403 for the dominant phenotype contains two unknowns. Assuming “w” is dominant and “g” is recessive, we have q^2 = .597 (the frequency of the gray phenotype “gg” in the 2011 count). Thus, q = .773 (the gene frequency for the “g” allele) and p = .227 (the gene frequency for the “w” allele). But which is it: p = .227 or q = .635? All by itself, this single gene frequency sheds little light on the question of dominant or recessive inheritance. But taken together with the other 14 data points, we may be able to identify trends that support one model over the other. In Figure 2, I have plotted the two possible values (one for p and one for q) for each of the 15 years of the squirrel count and ran a trend line through them separately. The slope of the trend line represents the rate of change not of the phenotypes but of the alleles that determine them. The slope of the top red line shows the rate of change for the “w” allele if it is recessive. The slope of the bottom blue line shows the rate of change for the “w” allele if it is dominant. Both slopes are gradual and positive (favoring the white variant) but have different values discussed below. To a biologist, gradual change is one definition of evolution (some prefer to refer to this kind of small change at a single gene as micro-evolution). Thus, the slope of the trend line is a measure of the rate of evolution for this trait over the last 15 years. Double click on the figure. Now you should be able to read the formula for the trend line more clearly. We are primarily interested in change of the variable on the y-axis (percent white) as a function of the variable on the x-axis (years). That relationship is given by the number immediately preceding the “x” in the equation, i.e., .0113 if white is recessive (q) and .0074 if white is dominant (p). These rates of change are usually referred to by the Greek letter delta which looks like a triangle. Since that character is not available on my keyboard I will refer to delta-q for the top red trend line and delta-p for the bottom blue one. Thus, the two models yield different estimates of the rate of evolution The recessive model yields a rate of evolution of more than 1% per year, 1.53 times higher than the dominant model (.0113/.0074). This would be one of the highest rates on record for any species (comparable with that for the peppered moth in England from 1850-1950, a classic textbook example). That for the dominant model is still high but more reasonable. They also differ in their assignments of relative fitness (which is ultimately measured in terms of reproductive success though often thought of in terms of survivorship and fecundity) of the variants. In population genetics, the most fit phenotype (white in this case) is assigned a fitness value of 1.0 whereas that of the less fit phenotype (gray) is 1.0 – s where s is the selective coefficient or its relative disadvantage (how much natural selection is acting against it). Most evolution text books that have a section on population genetics will derive equations for the rate of change (delta-p or delta-q) for an allele as a function of p, q, and s. These equations are shown in Table 1. In this case, I already know the two possible deltas from Figure 2. They are the slopes of the red and blue trend lines. With a little algebraic manipulation, I can rearrange the equations to solve for s instead of delta-p or delta-q (also shown in Table 1). Plugging in the values I calculated for p, q, and the deltas above, I get s =.0745 if “w” is recessive and s = .0528 if “w” is dominant. Remember, these s or selective coefficients measure how much the fitness of the gray variant is reduced relative to the white. That means the gray variant would be 94.7% as fit as the white variant if the latter was determined by a dominant allele but only 92.6% as fit if “w” was determined by a recessive one. Both of these values are within the realm of possibility. We now have an emperically determined value for s which we can assume for discussion purposes is a constant (either .0528 or .0745). We know the current value of p and q for the dominant and recessive models, respectively. These differences are summarized in Table 1 below. Stare at these numbers for as long as you wish, I don’t think you will find convincing evidence for one model over the other. 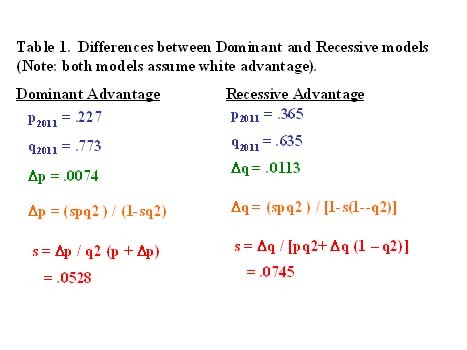 The values associated with the dominant advantage model are less extreme than for the recessive advantage model but both are within reason. The problem with Table 1 is that these are static values. The key to understanding the difference between the two models is in the dynamics. How these values interact to bring about change in the population. Which model predicts the type of change we actually see taking place. According to folklore, a pair of white squirrels were released in 1951. Squirrels can have two breeding seasons per year if conditions are favorable. Thus, there have been about 120 breeding seasons since the introduction of the white variant. Assuming that the population size in 1951 was approximately what it is now (3,000-5,000), the original gene frequency was in the order of .0005. Starting with this low frequency, we can use the same equations referred to above and illustrated in Table 1, to estimate the incremental change in gene frequency for each breeding season. By adding that delta-p or delta-q to the previous gene frequency, we come up with the new gene frequency for the next generation. By iterating over and over again we can estimate the number of breeding seasons necessary under both white dominant and white recessive models to arrive at the current status (white frequency of .403) and compare them to the actual number of breeding seasons (120). Figure 3 is a flow diagram for a computer program simulating this process. The results from running this computer program are shown in Table 2. The recessive model requires over 25,000 breeding seasons to reach current values. Being recessive requires a gradual build up to some threshold level (about q^2 = .0004 or q = .02 in a population with N = 4,000) before white offspring start to be produced and selected for. 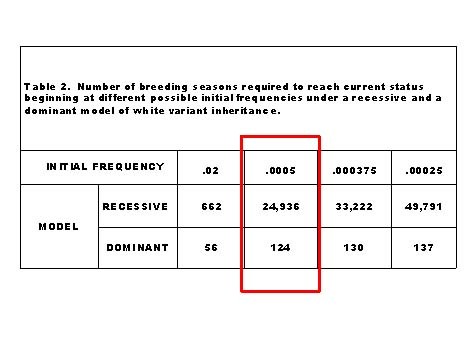 As can be seen in Table 2 below, from this point (q = .02), it would still require 662 breeding season to bring the white variant to its current frequency (q^2 = .403 and q = .635) starting at this unrealisticly high value (although both of the released squirrels would be homozygous in the recessive model, for 4 alleles to equal 2% of the population’s gene pool would require a population size of only 100 squirrels, approximately one fortieth of the current population size). More likely initial frequecies are also shown in Table 2 (click on table for enlarged image) and assume a population size of approximately 4,000 as it is today. The exact numbers are not important. As you can easily see, there are orders of magnitude differences between the recessive and dominant models in the number of breeding seasons necessary to reach current values. Now lets examine the predictions of the dominant model more closely. If the two white squirrels released in 1951 were both homozygous “ww”, the initial frequency of that allele would be about .0005 (middle column of Table 1). If they were both heterozygous “wg”, it would be closer to .00025. If one was homozygous and the other heterozygous, the “w” allele would have a intermediate frequency such as .000375. In any case, since a dominant allele can not be masked, the dominant model reaches the current state between 124 and 137 breeding seasons, a remarkably close fit to the actual number between 1951 and 2011 (122). In science we rarely prove anything. Rather, we collect data that is consistent with or supports one hypothesis over another. Clearly, in this case, the data supports a dominant model over a recessive one. Both models predict a continued increase in the percent white but at different rates. The dominant model predicts that the white variant will be in the majority in 14 breeding seasons or about 7 years. Only time will tell. But don’t expect the gray variant or its “g” allele to disappear all together from the Brevard population. 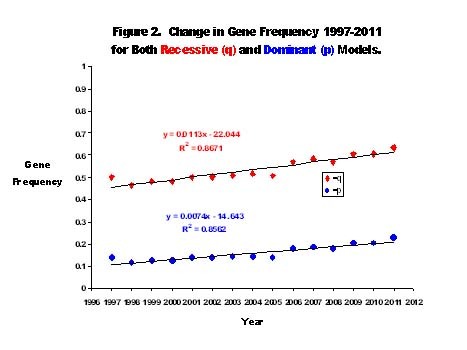 The rate of change in gene frequency is not linear as the trend lines suggest. Since delta-p and delta-q are dependent on p and q which are changing as the “w” allele increases in frequency, the deltas will also change. They are closest to linear in the mid range where they are now (between .2 and .8) but slow down as one gene approaches fixation and the other extinction. If the gray variant is recessive to the white, as it becomes very rare, most of the “g” genes will actually be carried by heterozygous (“wg”) white squirrels. When two such white squirrels mate, we would expect approximately 25% of their offspring to be gray. Thus, “gg” gray squirrels will be continuously regenerated. Final Note: We think these squirrels were captured and released in Brevard from Madison FL where they are also very successful. Transplants from the Brevard population have thrived in their new homes, e.g., Walkertown NC. On the other hand, this coat color pattern is present but at very low frequencies throughout central and northern Florida. Perhaps the success of the Brevard white squirrel has little to do with its coat color, per se. The “Adam and Eve” released in 1951 may have carried a gene or genes making them disease resistant, fecund or otherwise vigorous that are closely linked on the same chromosome as the gene(s) for coat color. Never-the less, the inference outlined above regarding mode of inheritance would still apply.